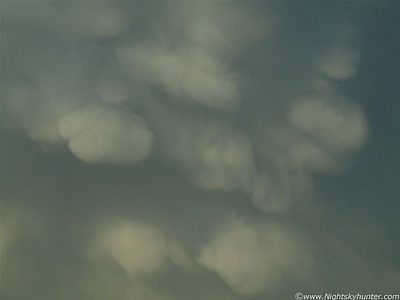 Two sets of reports documenting my first attempts at convective photography covering a selection of events during 2006 featuring mammatus clouds of which the December 1st and September 18th displays were most spectacular. 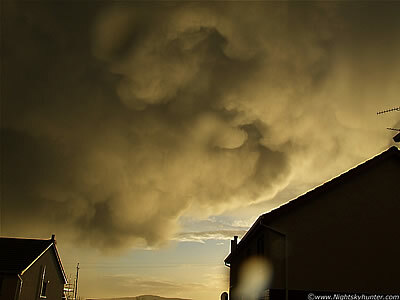 Incredible Armageddon-style low level Mammatus display, gold in colour, and menacing in appearance as it passed over my home on December 1st 2006 before sunset. This was a beauty. Short report with 13 images. - REPORT. A nice Mammatus display on September 18th 2006 on the underside of a large anvil on a very unsettled day with sudden strong gusts of wind, torrential rain, and hail. There was also a tornado risk on this today. Short account with 8 images - REPORT.